Daniel Solis: Koi Pond version 1.3, plus plans for Koi Pond: Moon Village! Koi Pond version 1.3, plus plans for Koi Pond: Moon Village! I'm back from Toronto! Lots of stuff to share, but first I'm updating the rulebook for Koi Pond on the DriveThruCards page. I've also sent along this message of thanks to those who have picked up the game so far. First, thanks so much for picking up this first game from Smart Play Games. I hope you've had a chance to play and enjoy it with your friends and family. With luck and spirit, this will be the first of many clever little card games to be released on DriveThruCards. One of the great things about releasing games through DTC is that I can respond to your questions by updating the live rulebook. Version 1.3 answers two main questions that were left a little ambiguous in 1.2. Q: If multiple players have hybrids in their rivers, who decides their hybrids' suits first? A: This can be a tricky situation if an opponent has a turtle that could score from one of your hybrids, depending on which suit you decide. This is a somewhat rare occurence, but can happen often enough that a turn order system ought to be established. So here it is: The start player decides the suit for his earliest hybrid first, continuing clockwise until all players have decided the suits for all their hybrids, one at a time. Q: Should the lake be a separate deck? Is there a "top" of the lake? A: This was left far too vague in the last rulebook. To be clear, the lake is meant to be an undifferentiated loose pile of cards comprised of the previous round's river cards. There is not "top." All lake cards are accessible to the active player during their draw phase. I've revised the setup diagram on page 1 to more clearly show this pile of cards. These notes are now incorporated into the main rulebook. 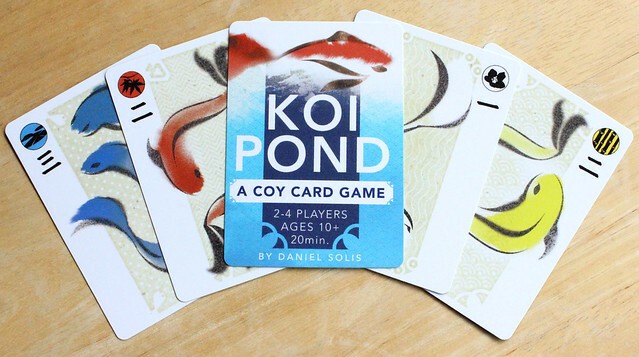 In addition, I've added a print-and-fold tuckbox for your Koi Pond cards. It's sized to fit your complete deck, plus extra space if you want to sleeve your cards. Hope you dig it! Thanks again. • "Win a round scoring koi in all four suits." • "Win a round without using a cat, crane or turtle." • "Win a round scoring koi of only one suit." • "Win a round scoring only scoring with a cat, crane or turtle." • "Win a round with the most Koi of X suit in your house." • "Win a round without drawing cards from the lake." These are still very early in their development, but intended to be pretty modular. So if you like Challenges but not the Villagers, you can use them independently of each other. Thanks again for your support! Please share your reviews and comments with me directly at gobi81[at]gmail[dot]com or on the official Koi Pond BoardGameGeek page! P.S. If you're having trouble downloading the 1.3 rulebook from DriveThruCards, you can also get it here.